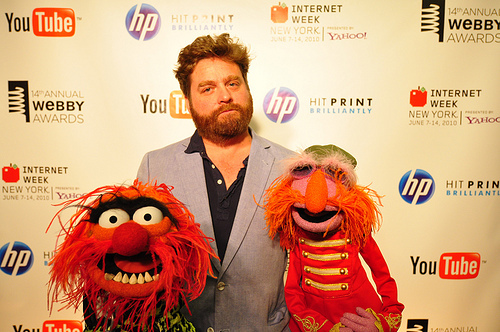 I couldn't be more excited about Jason Segel's new Muppet movie, especially now that Zach Galifianakis is attached. Above, Zach with Animal and Sgt. Floyd Pepper at the Webby Awards earlier this year. Greg Kot, host of NPR's Sound Opinions and music critic for the Chicago Tribune, takes on one of all-time biggest debates in rock music with his new book, The Beatles vs. The Rolling Stones: Sound Opinions on the Great Rock 'n' Roll Rivalry. In other music analysis news, legendary rapper Bun B has confirmed that he'll be joining the faculty of Rice University to teach “Hip Hop and Religious Studies” this upcoming spring. Elijah Wood will star in the new FX series Wilfred, about a guy and his alcoholic dog. The show is based on an Australian show of the same name. Wilfred follows on the heels of several great shows FX has done recently, including Terriers with Donal Logue and Louie, the current project of comedian and writer Louis CK, who's been a guest on TSOYA on multiple occasions. Louie is available now on Netflix instant streaming. The show is a satirical look at a comedian's life in New York City post-divorce, and is by turns trippy, realistic, and poignant while being consistently funny. If you haven't caught it on FX, Season 1 of Louie is now streaming on Netflix.